My suggestion? Keep it simple and let a statement necklace do the work. There are so many ways to play it with your outfit, from a simple, fitted tee, to your boyfriend's shirt, to a crew or boat neck sweater. 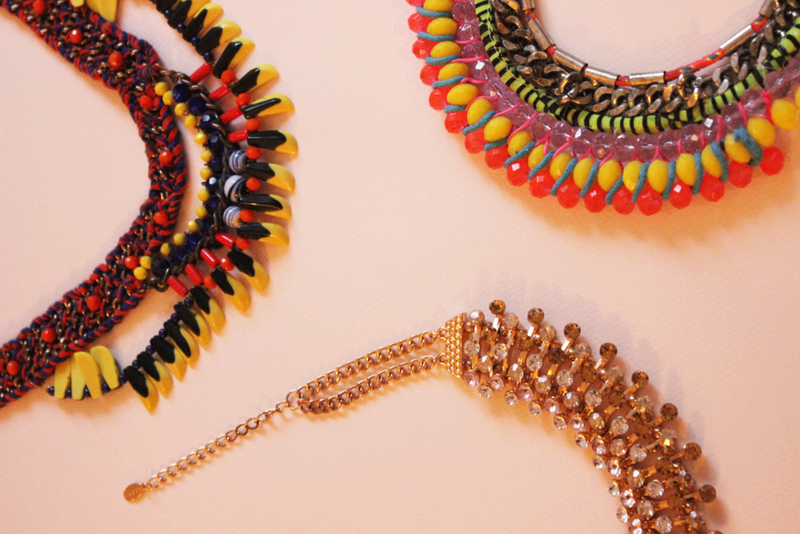 Adding a statement necklace to any of these will take your look from whatever to YAS. Pick a simple and neutral outfit (jeans and a tee or sweater = perfection), let the necklace be the focal point and do the talking. Pick a top with a collar that matches the shape of the necklace. If the necklace is shorter and quite round, pair it with a crew neck top (see image above). The bolder, the better. Werk those colours. Even if you hate Valentine's Day and plan to celebrate with a bottle of wine at home, this is a great trick to have in your back pocket for lots of other scenarios. Or, if you're looking to punch it up a notch with your outfit, you can look back on this and this for some inspiration. Would love to see what you come up with: send me pics of your outfits to lhstylecoach@gmail.com, on Insta (tag me in them - @lhstylecoaching), or post them on my Facebook page. If you have any questions about this quick fix or anything else, leave it in the comments section below.